These properties are of timber-framed construction (mock Tudor) and were built in the early 20th century as a replica of the two-storeyed, late medieval buildings, which previously stood on this site. They do, however, incorporate some of the original re-used timbers, which were presumably from the earlier buildings. The properties were originally built as houses but the ground floor accommodation is now occupied by various retail businesses, with the upper floors having been converted into flats for residential use. 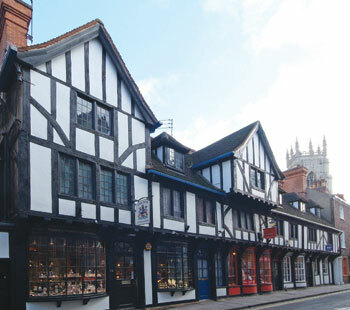 The Trust purchased these properties on 26 October 2007 from The Dean and Chapter of the Cathedral and Metropolitical Church of St. Peter in York, along with 20 and 22 High Petergate.